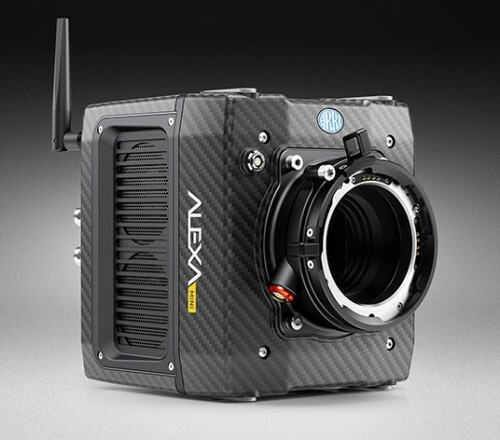 Arri presents the ALEXA Mini. It’s shaped as a cube and has the same image quality and power of an Arri ALEXA, but in a much smaller carbon fiber case. Alexa Mini is smaller and cheaper and than the Arri Alexa. It competes directly with the RED EPIC. The ALEXA Mini can record 4K UHD ProRes images. This facilitates real-time 4K UHD output and simple pipelines for high-resolution deliverables. The camera includes Wi-Fi control for just about every feature, including ND filters and lens motor. This is ideal for remote operation such as drone or other remote vehicle. Arri Lens Data System (LDS) technology brings frame-accurate metadata about focus, iris and zoom settings. With these lens settings and exact depth-of-field displayed live on wireless hand units, precise adjustments can be made during a shot. An optional external Codex multicam recorder, offering a combined total of up to 360 fps of uncompressed ArriRAW recording bandwidth from multiple ALEXA Mini cameras. To achieve high overall image quality, Arri uses bigger and better pixels in the sensor, rather than smaller pixels in larger numbers. The ALEXA captures a wider dynamic range, truer colors, lower noise and more natural skin tones than other cameras, whether the chosen output is HD, 2K, 4K UHD or one of the native resolution outputs like uncompressed ArriRAW 2.8K or ProRes 3.2K. The ALEXA Mini’s camera speeds range from 0.75 – 200 fps. This enables it to also be used for HFR (High Frame Rate) acquisition. Arri believes this helps future-proof the camera. The camera will shp in May, 2015 and retail for between $30,000 and $40,000 depending on options. For more information visit The Arri Alexa Mini Site.